Freedom Fighters #3 (1976) – battle at the World Trade Center! Quality Comics was a successful comic book company during the medium’s golden age. 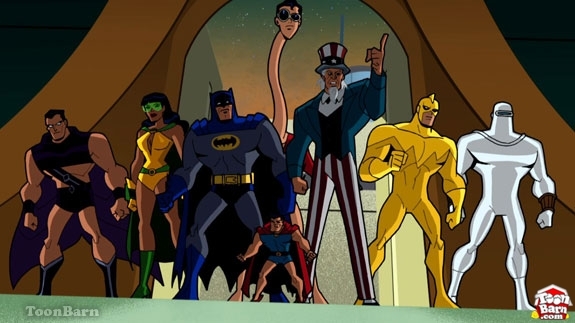 It introduced Kid Eternity, the Blackhawks, the much-lauded Spirit and Plastic Man to comics. The company closed shop in the mid-1950s and the catalogue of characters was bought by DC/National. They continued only four of Quality’s titles: GI Combat, Plastic Man (although DC would not publish a Plastic Man comic until the 1960s), Blackhawk, and Heart Throbs – all but the latter were still being published by the time of the Bicentennial (Plastic Man especially would get much more popular in the coming decades). But what of the other characters of the defunct company? 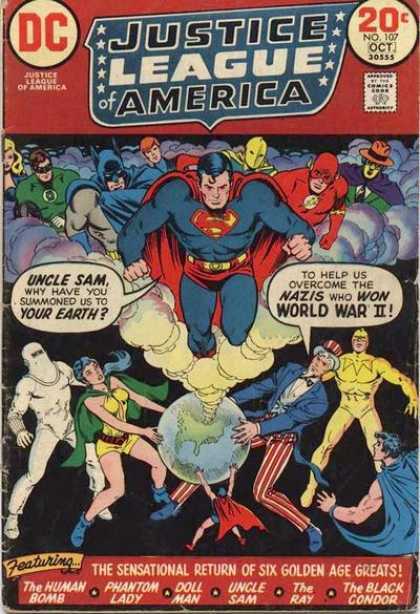 They languished until 1973 when they were introduced to DC readers in Justice League of America #107 in that group’s annual meeting with the Justice Society of America. A letter writer in this issue questioned that – why not have adventures on “their own” earth showing the group rebuilding their world? The editor said that would not make a very good comic book. Perhaps, but would the sales of the comic have been any worse than they were for their adventures on Earth 1? The editor guaranteed there would be an issue #4, an odd thing to say for a successful comic. The comic lasted for 13 issues – personally I loved every one of them! In my opinion the first issues were, indeed, stinkers; but the series picked up steam after a while. I particularly enjoy the “secret” Marvel crossover in issues #8 & 9 with the Invaders. Thinly disguised versions of Namor, Captain America, Bucky, the Human Torch and Toro fought our heroes. 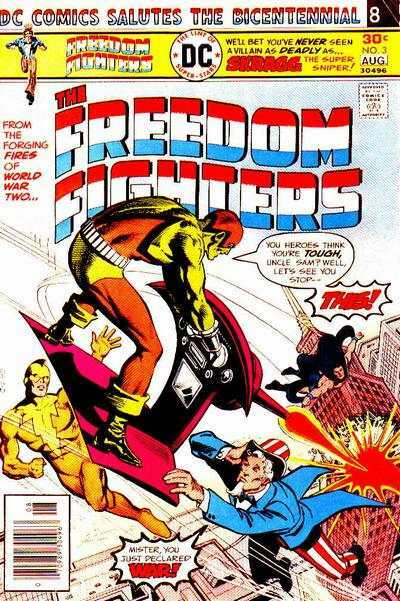 Mirror dopplegangers of the Freedom Fighters appeared in the Invaders comic. 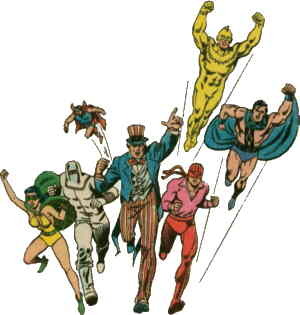 Freedom Fighters was cancelled just before the “DC Explosion” of 1978 and merged with Secret Society of Supervillains. SSOSV was cancelled too – no “Explosion” issues were released, although it is available in the Cancelled Comic Cavalcade and as a SSOSV trade paperback. But the cliffhanger – the Silver Ghost hires a company of villains to defeat the FF once and for all – was never resolved. Referring to them as the FF in the letter columns and the comic itself seemed awkward. Who didn’t first think of the Fantastic Four, instead? Although this issue contains a done-in-one story, a back story continues through the series – the FF are on the run from the police after being tricked by the Silver Ghost (in issue #1) into helping him commit crimes. The FF escape from a police showdown (last issues cliffhanger, I presume), and hide out in a dumpy loft apartment. Doll Man creates an invisible shield for them. Meanwhile, Arthur T. Sommar finally snaps and kills his wife. He goes to work and ends up in the midst of a battle between the FF and a gang of sport-supply store robbers! Unbeknownst to all, two youthful Qwardian teenagers are exploring earth and also chance upon the battle. They bombard Sommar with a Staser ray to even the odds – mutating him into Scragg the Super Sniper! The FF defeat Scragg and take him in for questioning. He reverts back to Sommar and calls his lawyer. The operator has a similar screechy voice as his wife, which snaps him back into his Scragg persona! The FF defeat him again at the twin towers of the World Trade Center (Human Bomb: “What’s this clown’s next act — fragging those towers?” 20/20 hindsight makes this reader want to say, “Ouch…”) with the Human Bomb taking the brunt of Scragg’s damage. The Ray tries to grab Scragg’s arm before he plummets to the pavement, but his hand goes ethereal like Phantom Girl’s and Scragg slips away! The incorporeality is likely due to the invisibility ray, Doll Man assumes. Back at their loft, the FF realize they signed a lease under their civilian identities – which are known by the police! They must leave. Where can they go to be safe and not hunted like criminals? Where? Wonder Woman appears next issue per the last-panel blurb! That issue (#4) was the first issue of Freedom Fighters I owned and read. Freedom Fanmail: Mike White of Mackinaw, IL (positive, although the Ray’s contempt of Uncle Sam was criticized – Conway explains that although the FF joined together for common purpose, they aren’t buddies!) and Harvey Sobol of New York, NY (negative – criticizing the art and their move to Earth 1 instead of helping rebuild their own home world).